Home Color Ideas	Violet’s Favorite Winter Greens! With our large selection of Greenery, we know it can be a bit overwhelming to decide which is best for you, so we are going to break it down into a series of blog posts, and today, we have our resident wedding flower planner, Violet, here to fill you in on her favorite Winter Greens! Really, these are wonderful for most times of year; They can be used in a Southern wedding for that perfect touch of greenery in arrangements, hung from chandeliers or fixtures to create a Gothic or vintage look, flipped over to their naturally velvety brown undersides to add a cinnamon brown color, tucked into bouquets, used as very ‘green’ place-cards, or even ‘gilded’ for an upscale touch. They work well with all sorts of flowers, but hydrangeas, garden roses, amaryllis and lilies are some classics that come to mind. 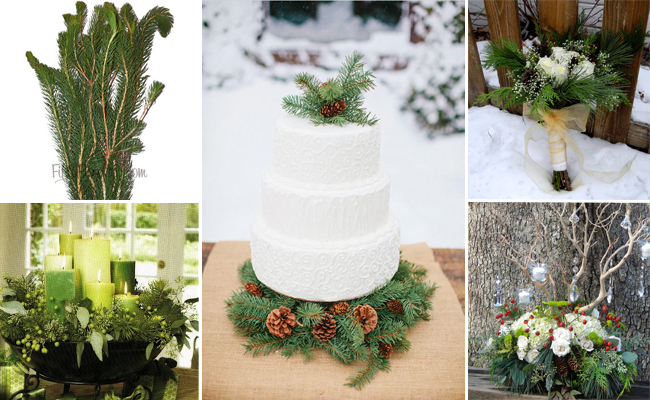 Different than regular pine (but with that same yummy scent that wraps up all the good things about winter together) due to its’ curly end fronds, this is a great way to add both texture and a little symbolism to your wedding or event; To many Native people, the pine tree is a symbol of wisdom and longevity as well as being the tree of peace. In Asian cultures, it is associated with longevity, virtue, and youth. They are also associated with masculinity and power. In Nordic countries, it is also a symbol for the season and is used in medicinal tinctures as well as decorations. I’m Norwegian, so I like the wedding tradition of planting two small evergreens outside your door on your wedding day – you could lay sprigs on each napkin and attach a place card, add these tall curly fronds to ceremony arrangements, a canopy or bend them gently into mini-wreaths and hang them from the chairs going down the aisle with a ribbon to match your look. 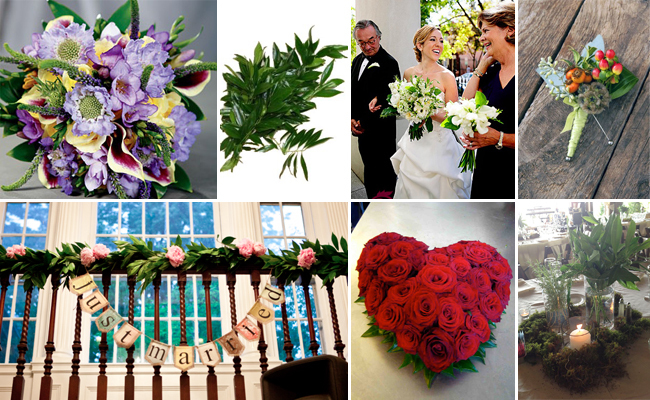 Great for rustic or country weddings, but equally at home with a modern look, if done right, curly pine is a star! Plays well with: Snapdragons, cremon mums, sunflowers, waxflower, and stock. Quite a mouthful to say, but this jester is ALL about fun! 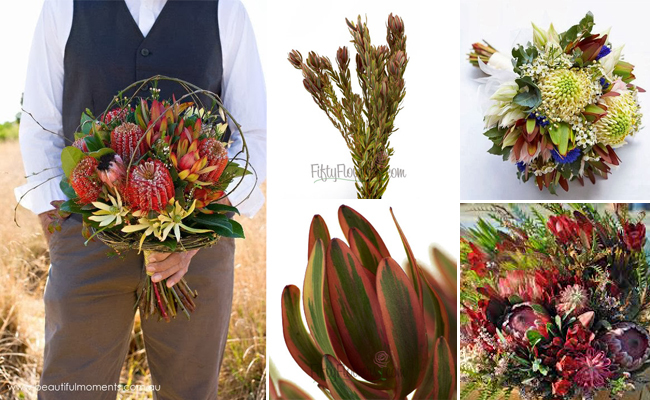 I would LOVE to see someone use the very tips en masse as a texturally fabulous bouquet along with succulents, pincushion protea, billy balls and clusters of chocolate mini cymbidiums, with perhaps a stems of few ranunculus or garden mini roses thrown in for texture. Not for the faint of heart, this bold statement green bridges the world between flowers and greenery admirably. Everything that you’d want in a green; Shiny, dark, glossy leaves, hardy and full of life, these easy to work with lovelies would be equally at home with a riot of OTHER greens, dark plummy colors and reds, or soft pale peaches, pinks, light coral and blush. Try with: white blush peruvian lilies, queen annes lace, irises, and green goddess, white or blush callas. Pop behind a rose for a two minute bout, adorn a whole trellis with this for a slightly more wild /rustic look, or hang them from their stem ends from fishing line to create a ‘living hanging wall’ to draw attention to your ceremony or even frame guests as a backdrop for fun photos. Branches, Berries, and Baby’s Breath! 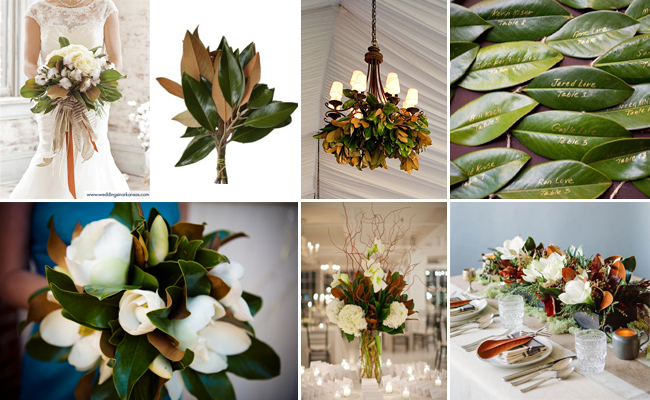 Save on these Winter Wedding Flower Favorites!